The new ISIS was now pitted against the governments of both Iraq and Syria, an array of local groups in both countries, including elements of the Free Syrian Army—the loose coalition of secular, “moderate” rebel groups backed by the West—and the Kurdish pesh merga, as well as the Nusra Front and other al-Qaeda affiliates. Some important Syrian groups that had joined in the Islamic Front, a coalition of seven major Islamist groups whose ideology fell somewhere between that of the moderates and the jihadists, initially pledged allegiance to ISISbut later recanted. (To add to the confusion, rival groups occasionally cooperate on the battlefield, forming the kinds of tactical alliances that are not uncommon in such tangled conflicts.) Despite what seemed to be an unfavorable starting position, ISIS made impressive territorial gains in Syria and Iraq. By the spring of 2014 ISIS astonished the West by sweeping almost unopposed into Mosul, and in June the offensive culminated with the declaration of the caliphate under the aegis of the Islamic State, now no longer limited to Iraq and Syria. A result of these fast-changing conflict dynamics is that theU.S. is engaged in a struggle for power in which the enemy of its enemy is not necessarily its friend. In the Islamic State as well as al-Qaeda and affiliates, the U.S. shares a common adversary with its enemies Iran and Syria. 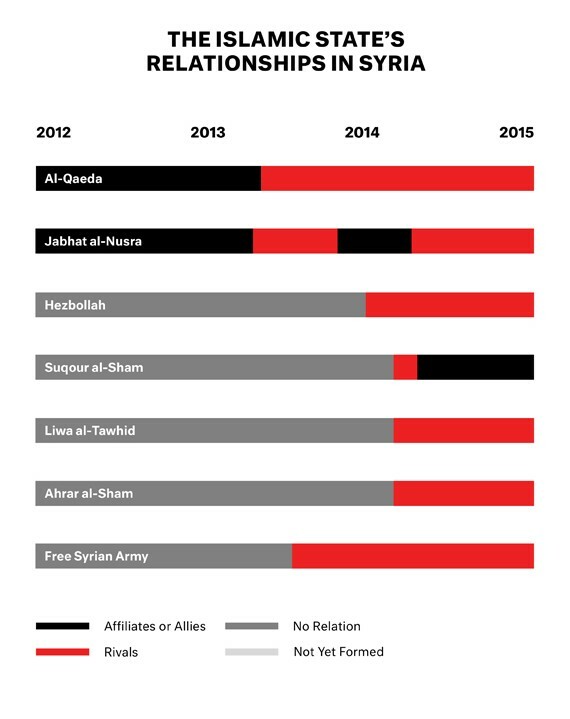 At the same time, actions against the Islamic State benefit al-Qaeda and affiliates, and vice versa. It may not be possible to weaken one without strengthening the other. “Moderate” rebels in Syria have not always stood up well against Islamist or jihadist factions. The only clear conclusion is that no solution is in sight.